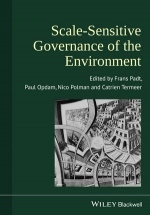 The editors use the concept of scales to create a conceptual and methodological basis for scale-sensitive governance of the environment. They bring together and reframe a variety of disciplinary and multidisciplinary approaches by explicitly addressing scale. The book presents new visions, methods and innovative applications of thinking and decision making across scales in space and time. It analyzes how scales are constructed and strategically used in policy discourses and searches for scale-sensitive governance approaches to intervene in socio-ecological systems. It also presents views on solving problems emerging from incomplete understanding, and provides insightful applications in case studies across the world. Specific research themes have been selected to show the benefits of recognizing scales in empirical research and how this can enrich policy practices. The opportunity to disseminate successful insights on scale-sensitive environmental governance will attract interest around the world and sets the agenda for future research.